Come and meet with WASIA to discuss important matters for our shearing industry in WA. The Association wants to hear from local contractors about issues you are facing, what’s important to you and how the Association can assist. We will have experts in the industry, law (Bailiwick Legal), worker’s compensation & insurance (PSC McKenna Hampton) and superannuation (Prime Super) on hand to answer your questions….and of course it’s always a good opportunity to catch up with others from our industry and have a drink and a good meal. Dinner and drinks available to purchase at The Boyup Brook Club, 81/83 Railway Parade, Boyup Brook. 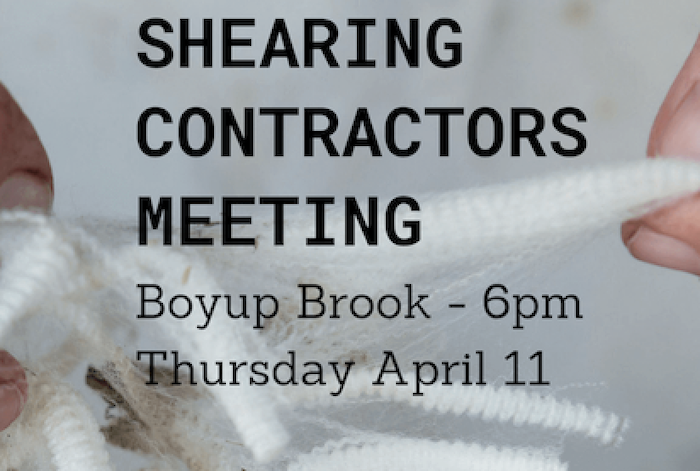 This is a great opportunity for local contractors around Boyup Brook to meet with the Association.